138 Commercial Real Estate & Properties in Burleigh Heads are listed in 5 categories. We have 99 Industrial Warehouses Lease , 26 OfficesLease , 11 Retail ShopsLease , 5 ShowroomsLease and 1 Development LandsLease . Unit 1 101m2 Leased Unit 2 100m2 Leased Unit 3 100m2 Leased Unit 4 273m2 Unit 5 154m2 Leased Unit 6 154m2 Unit 7 154m2 Unit 8 441m2 Unit 9 401m2 Unit 10 401m2 Large onsite car park Looping driveway for easy truck access 12,000L onsite grease trap Minutes to Tree Tops Shopping Centre, Stocklands Shopping Centre and Bunnings Approx Disclaimer: Ray White has not independently checked any of the information we merely pass on. We make no comment on and give no warranty as to the accuracy of the information contained in this document which does not constitute all or any part of any offer or contract by the recipient. Prospective purchasers / lessees must rely on their own enquiries and should satisfy themselves as to the truth or accuracy of all information given by their own inspections, searches, inquiries, advices or as is otherwise necessary. No duty of care is assumed by Orchid Avenue Realty trading as Ray White Surfers Paradise Commercial divisions toward the recipient with regard to the use of this information and all information given is given without responsibility. 382sqm Factory/warehouse - Incentives Available! $3,600 pcm + Outgoings + ..
120m2 retail space on busy road 40m2 alfresco area Plenty of car parking Grease trap and extraction in place for food use Ideal location for showroom style tenant Directly opposite Bounce Burleigh Rare opportunity will not last long Approx. Disclaimer: Ray White has not independently checked any of the information we merely pass on. We make no comment on and give no warranty as to the accuracy of the information contained in this document which does not constitute all or any part of any offer or contract by the recipient. Prospective purchasers / lessees must rely on their own enquiries and should satisfy themselves as to the truth or accuracy of all information given by their own inspections, searches, inquiries, advices or as is otherwise necessary. No duty of care is assumed by Orchid Avenue Realty trading as Ray White Surfers Paradise Commercial divisions toward the recipient with regard to the use of this information and all information given is given without responsibility. 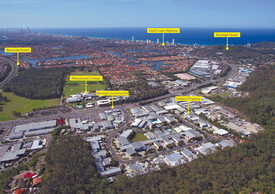 Burleigh Industrial $4,490 pcm + Outgoings + ..